Shakura S’Aida was born in Brooklyn, raised in Switzerland, and now lives in Toronto. Time is the Electro-Fi debut of this highly talented Singer/Songwriter. Pronounce her name “Shack-oora Sigh-ee-da”. It means “Thank God”. As a solo artist, Shakura’s career has spanned genres and countries and taken her to some of the most noted stages in the blues and jazz worlds. She’s performed at the New York’s Apollo Theatre, has been featured with Jimmy Smith, has sung backup behind Patti Labelle and is equally at home singing material with a Ray Charles tribute band, or presenting a one-woman show of the music of Nina Simone. Shakura S’Aida is also the 2011 Maple Blues Female Vocalist of the Year & 2011 Indie Blues Artist of the Year. 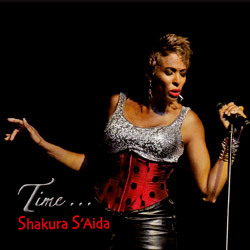 This special 2-disc set showcases two sides of Shakura S’Aida – Disc 1 “Time To Rock My Soul” and Disc 2 “Time For The Blues” and features special guests Harrison Kennedy and Kenny “Blues Boss” Wayne. Shakura S’Aida is proud to sing the Blues, proud to Rock out, proud to acknowledge the past and be part of the future, proud to make music that touches her soul – and which she hopes will touch yours. Time is available in fine record stores in Canada and the USA, as well as at amazon.com and direct from electrofi.com. Previous post: Toronto For KigaliUP Music Festival Fundraiser…..